Jack Daniel's 4-Piece Stainless Steel Flask and Shotglass Gift Set | BUDK.com - Knives & Swords At The Lowest Prices! 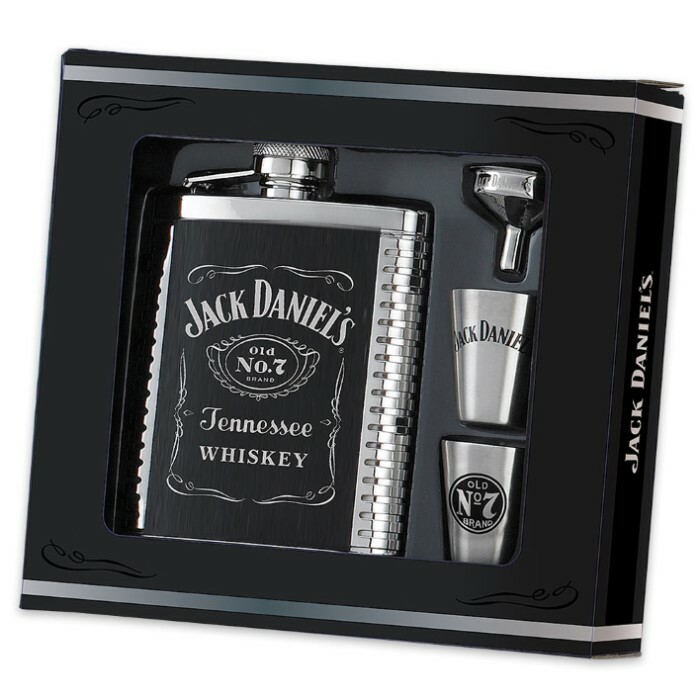 You don't have to be a Jack Daniel's fan or even a whiskey drinker to look suave and debonair wielding this handsome gift set. There's just no cooler way to sip your favorite beverage! The classic 4-piece set includes a 6-oz hip flask, two stainless steel 1-oz shot glasses and a steel flask funnel. Jack Daniel's iconic "Old No. 7" logo is inset prominently on the side of the flask, accented with silver screened lettering, ribbed edges and a handy captive screw top. The shot glasses are trimmed with the Jack Daniel's swing logo one side and the "Old No. 7" button logo on the other. "Jack Daniel's" in delicately engraved in the funnel, and the whole set is housed snugly in a stylish black gift box. Whether for Christmas, a birthday, Father's Day or any occasion, this elegant gift set is sure to be the present everyone remembers. Don't forget yourself! Thanks to our unbeatable prices, it's painless to get two sets - one to gift and one to keep! You'll find Jack Daniel's legendary charcoal filtered Tennessee whiskey never tasted as sweet as it does poured from this flask and sipped from these shot glasses!